As a company our vision is to develop futures and our mission is to engage and deliver a range of quality programmes that develop, lead and inspire. 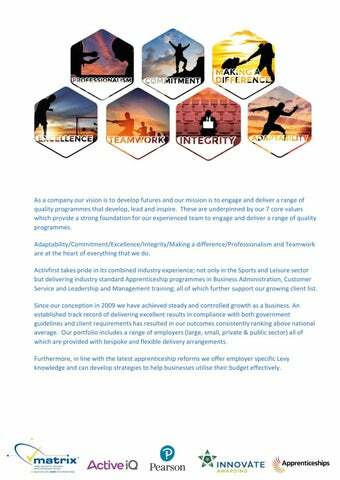 These are underpinned by our 7 core values which provide a strong foundation for our experienced team to engage and deliver a range of quality programmes. Adaptability/Commitment/Excellence/Integrity/Making a difference/Professionalism and Teamwork are at the heart of everything that we do. 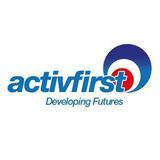 Activfirst takes pride in its combined industry experience; not only in the Sports and Leisure sector but delivering industry standard Apprenticeship programmes in Business Administration, Customer Service and Leadership and Management training; all of which further support our growing client list. Since our conception in 2009 we have achieved steady and controlled growth as a business. An established track record of delivering excellent results in compliance with both government guidelines and client requirements has resulted in our outcomes consistently ranking above national average. Our portfolio includes a range of employers (large, small, private & public sector) all of which are provided with bespoke and flexible delivery arrangements. Furthermore, in line with the latest apprenticeship reforms we offer employer specific Levy knowledge and can develop strategies to help businesses utilise their budget effectively.